In 2008, the Canadian Obesity Network’s Board of Directors identified weight bias and stigma as one of the Network’s top strategic priority. 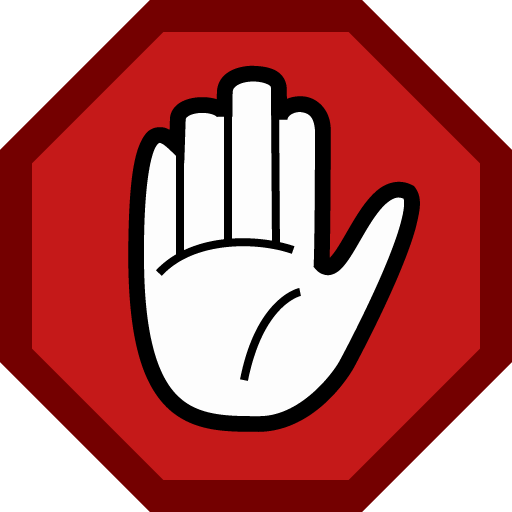 The board firmly believes that everyone deserves to be treated with respect and dignity independent of size. To this end, the Network is working hard towards reducing weight bias and stigma through research, education and action. Incorporated weight bias and stigma in all CON-RCO education and knowledge exchange programs such as the Canadian Obesity Summits (2009, 2011, 2013, 2015 and biennially thereafter); Dietitian Learning Retreats (2010-present); Canadian Obesity Student Meetings (2010, 2012, 2014); Obesity Research Summer School (formerly known as Obesity Research Boot Camp); Obesity Management Certificate for Post-Graduates (2013-2015). In collaboration with health services and primary care experts, CON-RCO has developed the 5As of Obesity Management framework to support primary care practitioners in their interactions with patients with obesity. This was a two-year initiative supported by the Canadian Institutes of Health Research (Knowledge Translation Supplement Grant) and the Public Health Agency of Canada (Innovation Strategy Grant). The resources incorporate weight bias sensitivity training and have now been adapted for pediatric and pregnancy populations. CON-RCO under the leadership of Dr. Mary Forhan, associate professor, University of Alberta, Faculty of Rehabilitation Medicine, Department of Occupational Therapy, coordinated the first Canadian Weight Bias and Discrimination Summit in Toronto, Ontario (January 2011). The purpose of the summit was to raise awareness about weight bias and discrimination as it relates to obesity and its association to the health and well being of Canadians. The event drew a capacity crowd of 150 health professionals, students, policy makers, industry representatives, and educators who heard from an expert panel of eight speakers from Canada and the United States. CON-RCO partnered with the Canadian Institutes of Health Research to inform a Canadian Bariatric Research Agenda, which included a priority on weight bias and discrimination. CON-RCO and the Public Health Agency of Canada collaborated to poll CON-RCO members to identify and counteract some of the most common obesity myths. Results of this study were published and disseminated to CON members and partners. CON-RCO partnered with the Rudd Centre for Food Policy and Obesity to develop an image bank to combat stigmatizing images of people with obesity in the media. In 2012, CON-RCO partnered with the World Obesity Federation (formerly known as International Association for the Study on Obesity) to host the first International Hot Topic Conference on Obesity and Mental Health. The outcome of this conference was a Charter calling for action for health system funders, researchers and health practitioners to deal with the stigma associated with both obesity and mental illness. 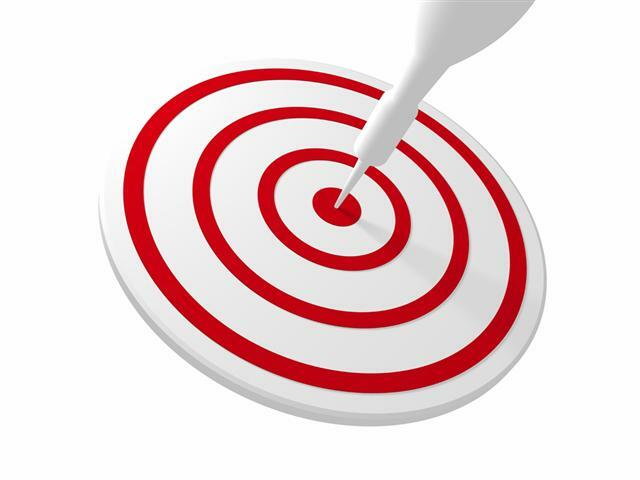 In 2015, CON-RCO partnered with the University of Calgary research leaders Drs. Angela Alberga, Shelly Russell-Mayhew, Kristin Von Ranson and Lindsay McLaren to participate in a two-day Weight Bias Summit (March 12-13, 2015). The objective of the summit was to bring together stakeholders (researchers, practitioners and policy makers) to discuss and facilitate the design of research projects aimed to reduce weight bias in three sectors (education, health care & public policy) in the province of Alberta. In May 2015, CON-RCO established its first Public Engagement Committee (PEC) comprised of people living with obesity from across the country. The mandate of the PES Committee is to be the voice of individuals affected by obesity within CON-RCO and to elevate the conversation of obesity and its impact on health in the community. In August 2015, CON-RCO established a collaborative called EveryBODY Matters. This group is composed of CON-RCO members working in research, healthcare, education, public engagement and policy. The mandate of this collaborative is to exchange knowledge, identify opportunities for collaboration across research and practice/policy sectors, and support CON-RCO’s efforts to reduce weight bias and obesity stigma in Canada. Not least as a result of these many activities, the Network has seen an impressive increase in weight bias and obesity stigma research in Canada. 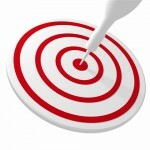 Thus, while the first Canadian Obesity Summit (2009) only received a handful of abstracts focused on obesity stigma. CON-RCO began to see a shift at the second (2011) and third (2013) Canadian Obesity Summits with more inclusion of weight bias research in the program. In 2015, the summit included four plenary presentations on weight bias, three workshops, and ten oral and poster abstract presentations on this topic. This remarkable shift in research interest in better understanding and addressing weight-bias is reflective of the Network’s considerable efforts to increase awareness of weight bias as well as the growing body of literature focused in this area. Clearly, all of this should be of interest to anyone living with obesity, who, unfortunately, continue to suffer the emotional, physical, social, and financial consequences of weight-bias and discrimination. To learn more about the Network’s continuing efforts to foster greater respect and a better understanding of people living with obesity click here. 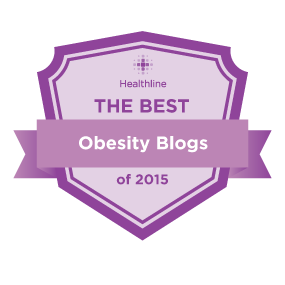 Does The Media Depiction Of Obesity Hinder Efforts To Address It? A study by Paula Brochu and colleagues, published in Health Psychology, suggests that the often unflattering depiction of people living with obesity in the media (as in the typical images of headless, dishevelled, ill-clothed individuals, usually involved in stereotypical activities – holding a hamburger in one hand and a large pop in the other or pinching their “love handles”), may well play a role in the lack of public support for policies to address this issue. 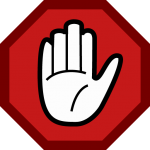 The researchers asked participants to read an online news story about a policy to deny fertility treatment to obese women that was accompanied by a nonstigmatizing, stigmatizing, or no image of an obese couple. A balanced discussion of the policy was presented, with information both questioning the policy as discriminatory and supporting the policy because of weight-related medical complications. The findings of the study show that participants who viewed the article accompanied by the nonstigmatizing image were less supportive of the policy to deny obese women fertility treatment and recommended the policy less strongly than participants who viewed the same article accompanied by the stigmatizing image. Given that negative and stigmatising images of people with obesity are the rule rather than the exception in media reports about obesity, the authors suggest that simply eliminating stigmatizing media portrayals of obesity may help reduce bias and foster more support for policies to address this problem. Readers may wish to visit the Canadian Obesity Network’s image bank Picture Perfect At Any Size of non-stigmatizing images of people living with obesity that are available for free download for educational and media purposes. 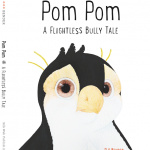 Yesterday, I posted about my daughter Linnie von Sky’s 2nd children’s book Pom Pom A Flightless Bully Tale, that is now available here. 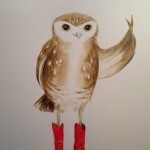 Today, I would like to introduce you to Sadly The Line-Dancing Owl, who one morning wakes up with a dark cloud over his head. Learn how Sadly in the end overcomes his sadness and how he finds the help he needs to be his happy self again. Along for the ride is the incredibly talented Ashley O’Mara as the new illustrator. Ashley is a Vancouverite, Emily Carr Graduate, Bird Lover (she draws the cutest darn chickens I’ve ever seen) and like Linnie, knows a thing or two about how much depression hurts. Please consider supporting Linnie’s fundraising campaign by pre-ordering your personal copy(ies) of Sadly The Line-Dancing Owl, which will again be 100% made in Canada. To learn more about Sadly and how you can support this venture, please take a minute to visit Linnie’s Indiegogo page. 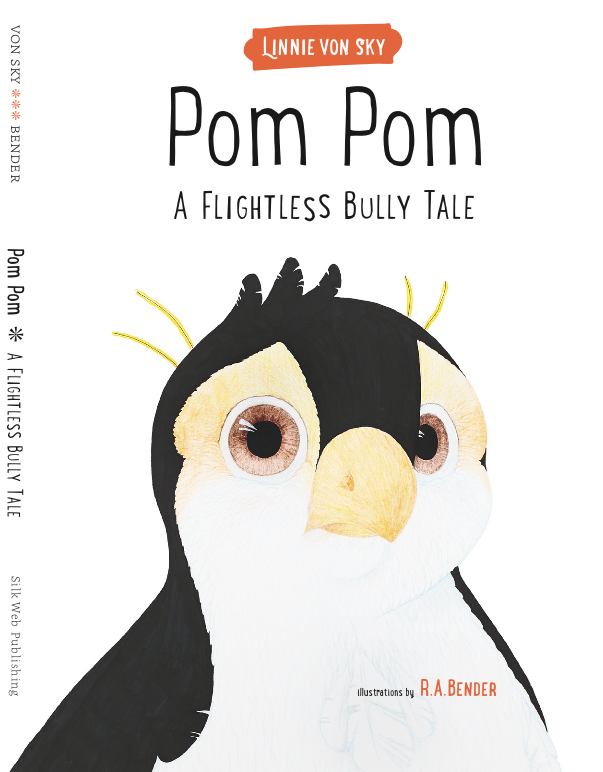 Today’s post is to announce the arrival of my daughter Linnie von Sky’s second children’s book, “Pom Pom A Flightless Bully Tale“, that hundreds of you helped fund by pre-ordering your copy(ies) about 12 months ago – your books are in the mail and should be there in time for the Holidays (a big THANK YOU from me for your support!). To those of you, who are new to these pages, Pom Pom is the story of the slightly rotund little penguin Pomeroy Paulus Jr III., who simply hates it when people call him “Pom Pom”. Like any boy his age he’s busy trying to impress ‘the birds’, particularly one bird: Pia. Pomeroy dreams of a pair of orange swim trunks; the ones that Pete, Pucker and Piper own. The same ones Pia said she loved. There’s just one little hiccup. The antAmart doesn’t carry them in his size. The story tells of how mom helps Pomeroy get his own pair of orange swim trunks and how Pia saves the day when she steps up and puts bullies in their place. For von Sky, whose protagonist in “Pom Pom” is picked on because of his size, the pain of bullying in the story echoes the passion she first tapped into working with the Canadian Obesity Network. “Weight bullying happens to be the one thing I’m extremely allergic to,” affirms von Sky. For any of you who would like to order your own copy of this delightful little children’s book about bullying, friendship, respect, sadness, empathy, standing up for friends, antarctica, penguins & above all, love (for ages 3 and up) – click here.